Encrypt twice. Shield yourself from online tracking and cyber threats. Meet Double VPN – our advanced security feature that encrypts your internet traffic not once but twice. Typically, when you connect to VPN, your traffic travels through a remote VPN server, which changes your IP address and encrypts all the data that you send or receive over the internet. Due to this setup, no snoopers or cybercriminals can see what you are doing online. Your traffic reaches a remote VPN server and leaves it securely encrypted. The encrypted traffic then passes through a second VPN server and gets encrypted one more time. You reach your internet destination securely and privately. All your data is protected with an extra layer of encryption. This makes it twice as hard for hackers to decipher. The connections are mixed between UDP and TCP protocols, which increases the security level of your online activities. As your actual IP address was changed by the first VPN server, the second server doesn’t have any information about you. Nobody, not even your ISP can see your final destination on the web. They can only know that you are using a VPN service. Why do I need double encryption? People who dare to stand up and advocate the freedom of speech have to take extra steps to protect themselves. With Double VPN you can access information securely, and report the news without the fear of being watched or harmed. Double VPN may be a great help if you travel or live in a highly restricted country, known for heavy censorship, tracking, and surveillance. By encrypting your internet traffic twice, you will make it twice as hard for snoopers to track you. Without proper protection your communications, your emails, messages, video chats could be vulnerable to eavesdroppers. Therefore, double traffic encryption is not only necessary to protect yourself, but also you confidential sources. If you want to prevent third parties from tracking your browsing habits or just need secure access to websites, a standard VPN connection is more than enough. Double VPN may slow down your connection a little. This is because your traffic goes through two VPN servers, which improves security but also makes the journey longer. For this specific purpose, we have the Onion Over VPN solution, which routes your internet traffic through one VPN server, and then sends it to the Onion network. If double encryption is what you need, go ahead and enable Double VPN. The feature is included in the NordVPN subscription package and is currently available in our Android, macOS (OpenVPN version), and Windows apps. 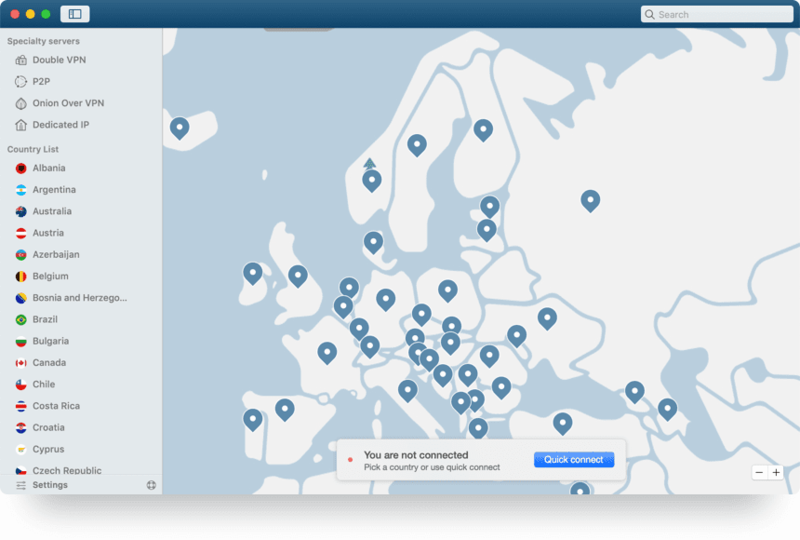 Open the server list in your NordVPN app and tap/click Filter. Once you choose Double VPN, you will see a selection of available server combinations. Pick the option that suits your needs best: depending on server locations, loads or distance. You’re all set – from now on till you turn Double VPN off, all your online communications will travel through two different encryption points, leaving no way for snoopers to access your data.